They might pull our triggers and load our ammunition, but hands very rarely get any of our love. All too often, they're relegated to the role of fleshy gun caddies, their potential locked away under featureless gloves. Not everyone has such a dismissive attitude towards hands, however; in Issue 297 of The Escapist, Chris Plante talks about the importance of hands, and examines how they can make a first person game more immersive. The best first-person games let their hands - not just the cut scenes and the NPCs - do the talking. During firefights in Far Cry 2, the protagonist's fingers or arms occasionally break. With his good hand, our man grotesquely resets the bone and tends to the wound. The sequence, initiated by the player, takes place nauseatingly close to the camera. In this one moment we learn valuable information about our hero: He has a practical knowledge of medicine, he's field trained, and he's a total badass. We don't need characters telling us this information, because we experience it first hand and as every film school drop out knows, showing is better than telling. 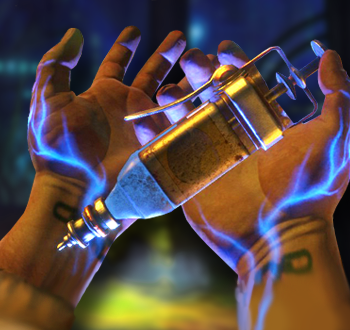 When combined, the first-person perspective and emotive hand animations can create affecting moments like these that tell story, flesh out the universe, and envelop the player. What we should take away from Far Cry 2 is that hands, like good actors, need to react. When they're injured, they sting. When they're trapped, they pound for help. When they're broken, they mend themselves. This is a better story-telling method than an AI character looking slightly to your right and grunting, "You're hurt." Plante goes on to say that hands are the body part that the player sees the most in a first person game, so not doing anything interesting with them is a waste. You can read more about it in his article, "The Hands' Job."